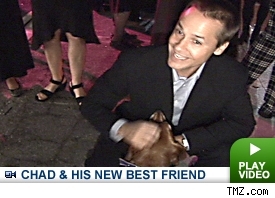 Chad Lowe made a rare public appearance at a fund raiser for homeless pets and was seen giving some genuine affection to a rescued dog named "Spunky". Not much has been seen of the actor since the drama about his split from Hilary Swank and alleged drug abuse in his past. But it seems the plight of suffering animals like Spunky is what it takes to get him back in front of the photographer's lens. Chad can be heard declining to be interviewed by a few magazines, but otherwise appears ready to re-emerge into the public eye.